Steel frame: The True Temper tubes on this bike are definitely springy and that fork does a nice job on the chatter. Big tire clearances. The MSO's fit well, although going much bigger wouldn't work on this rig. Comfortable positioning- The Gravel Mutt sits well with me in that regard, but many bikes could be that, I suppose. The main thing is that the head tube is long enough that I didn't have to resort to a funky riser stem. Head angle is good. 71° as I measure it, which is good for stability. Seat tube angle is 73°, which is par for the course. The bottom bracket height is a surprising 12". I knew it was high the minute I first mounted the bike, and in comparison to my Black Mountain Cycles rig, (a cyclo-cross inspired design), it sits 3/4's of an inch higher. In a world where cyclists demand that measurements be down to the millimeter and degree because they can feel the differences, that's a big, big difference. Okay, the balance sheet looks mostly positive, right? Well, that bottom bracket height is something that does make a difference in handling. When you get in the marbles, the bike's, (and subsequently the rider's), higher center of gravity pivots around an axis laterally that is unnerving at speed. The tires start dancing around and it has a very different attitude than my BMC does in similar situations. In fact, I can run smaller tires on the BMC and get a more secure feeling than the Mutt doles out. The Gravel Mutt tends to want to push the front tire off line in these situations as well, only adding to the feeling of instability. I don't know what speeds a cyclo cross bike reaches on courses those bikes are designed for, but regularly going 25-35mph on loose gravel? (Or faster many times.) I would be surprised if that was in the gene pool for a cyclo cross design. Those bikes have higher bottom brackets for a reason, and road racing bikes have lower bottom brackets for a reason. I would submit that a gravel road calls out for a more road bike-like geometry, and the Gravel Mutt points that way, from my viewpoint. In fact, knowing what I know now, I would not have taken the Mutt to the GTDRI. Those hills were steep, fast, curvy, and the really high bottom bracket on the Mutt would have been a bigger handful than they were on the BMC. It's good for the flats and tamer hills, but give me a lower bottom bracket for the fast, steep hills any day. WW4M: Bell Helmet "Super" Model. Bell Helmets are the ones for meeeeee! Ha! Well......it is true. They are. There's a good story behind this too. It goes back a ways to my high school football days. My time spent playing football from 9th grade through until 12th grade was all done in the same helmet. The school had to special order my helmet because my noggin was so big! It's a 7 7/8ths hat size, or about 64cm around the "dome". The high school, figuring that I had soiled the helmet for four years running and that they probably wouldn't ever need it again, let me have it after the senior season was over. Yep! Ever since then, finding a proper hat, let alone a bicycle helmet was frustrating. In fact, I never wore a helmet for years. That is, until one day I crashed and came millimeters from hitting my skull on a concrete water collection box. That was my "wake up call", if you will. So, I set out to find a helmet that might work. This would have been about 1992. I stumbled upon a Shoei model, (precursor to Troy Lee Helmets),which looked close, and ordered it up. It had a ton of foam material that I was able to dremel away to get a custom fit. I ended up owning two of those, and then moved to Giro helmets, which always fit weird on my head. A friend suggested I try a Bell Helmet, and it was love at first fitting. I've been wearing size Large Bell helmets ever since. Nothing else I've tried, (and I've tried others), works as well for me. So when it came time for a new helmet to fit my longish, narrowish, egg shaped brain case, I went with the newest mountain bike helmet from Bell, the "Super". In many ways, I feel it is the best Bell helmet yet for off road. Actually, it sort of reminds me of that old Shoei helmet I used to have. The Super sports a big visor, that moves up and down a fair amount. It has a thicker-than-road-bike helmet shell and thicker absorbing foam under that. It's got a big aluminum fastener for the visor, just like the old Shoei did too. But the Super is very different in some key areas. Of course, fit is the major one. I didn't have to dremel away any material on the Super! But there are some cool details I like. One of them is the strap system, which instead of being a webbing that intertwines into the helmet structure, is much more like my old football helmet, in that the straps are anchored into the "tabs" of the shell that come down either side of your ears. This makes the Super fit like a "helmet", and not like a "bicycle helmet", if that makes any sense. That said, it does have a rear structure that grips the back of the head via an adjuster knob. The Super also comes with a removable mount for a Go-Pro type camera. In fact it is a Go-Pro mount. I do not own a Go-Pro, but this might be a cool detail that you may appreciate. I happen to like the back of this helmet, which doesn't look all "aero" and pointy. This appeals to me on the looks basis, but also should prove to be hood friendly in Winter. The Super's visor is removable, but I have kept it on, and I like it for deflecting the odd branch, dirt clod, and it does a fair job of keeping the sun out of my eyes. I was a bit put out that I could not place my eyewear in the vents above the visor though, but I did discover the trick. You have to push the visor up, and then stick the glasses in the vents underneath the visor, then everything is right with the world again. Okay- with that crisis averted, I was settled and I can say the Super is, well.........super! I like it, and it works really well for me. It is no hotter than my roadie based helmet, and it has more coverage than that helmet does, which is probably a good thing for off roading. My only complaint so far is that the Super is heavy. A long ride might make me feel a bit like I wished for my lighter helmet, but sometimes I don't notice this. The Super weighs in at 430 grams. My roadie helmet, a Bell Ghisallo, weighs in at 350 grams. 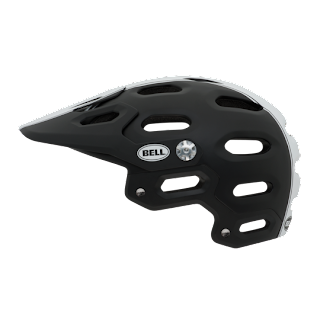 Bell has a trick goggle system for this helmet I want to check out for winter fat biking. But even without that, I know this is my off road, fat bike in Winter helmet of choice. It's got all the bells and whistles: X-static padding, the little dial in the back to fit the thing onto your skull, and adjustable straps with cam locks that are easily adjusted. The Super comes in several arresting color combos for about $125.00, which I find quite reasonable. So, yeah....this works for me really well. Note: I purchased this Bell Helmet Super with my own cashola, and I was not asked for this review, or compensated for it in any way. So there! Maybe It Should Be Called "All Road"
White tires. Old school look. 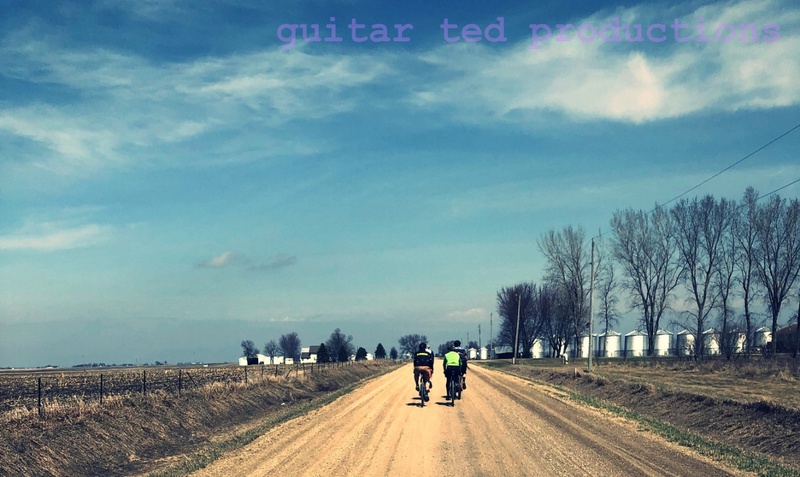 Friday a commenter on this blog asked an interesting question:" I think a more interesting question is: can a gravel bike be a decent road bike substitute?" I thought I'd take that one step further and ask, "Shouldn't a gravel bike be most people's road bike?" As in an "all road bike" kind of bicycle. Let's think about it, shall we? Because I think most road bikes are not the right bikes for most people. First of all, as I have written here before, traditional road bikes that are sold now are largely based off of expectations that a "road racing style bike" is "faster" and "lighter" which is obviously "better" for anyone. Right? It's the same type of bike, (and in some cases- the very same bike), that the "Pros" use, and why wouldn't you want that bike? Bike shop sales are largely based off of playing on this perception because it is easy, and the marketing machines make it seem that way. However; it is all pretty much snake oil. Most folks do not need such a bike. Most folks end up trying to make a road racing based bike something else, and even the manufacturers have been trying to play off that fact for a decade. Witness the rising tide of "endurance road bikes", as an example. This is just another repackaging of previous ideas that were foisted on us by the industry. These bikes are largely impractical since they are a road racing bike with only a slight nod to a relaxed seated position. My take is that the public isn't really ready for "the right bike", but that it is already appearing. The "gravel grinder" bike, with bigger tires, more relaxed geometry, and more practicality built in really makes a lot more sense than the traditional avenues folks take for their two wheeled pavement satisfaction. Oh....wait a minute! Maybe you want to ride a smooth trail once in a while. Or maybe you ride on some really bad roads, and think you need "another bike" to supplement your roadie. No.....no you do not, if you have an All Road bike. The typical gravel specific rig, (like the Tamland, shown here), is going to have sufficient rubber that curb hopping, smooth dirt, busted up pavement, and riding it all at speed will be no big deal. Plus- the geometry will be more stable and less punishing than any road racing based idea for a bike, (save maybe Trek's Domane). Oh yeah, maybe you need a rack, fenders, or a frame pack. try any of that on your fancy carbon shaped tubing. Uh-huh...... The gravel specific bikes will be way more practical in these areas. Areas that give traditional road bike owners fits because they can not make their racing bike fit their needs. See, you don't need three different pavement bikes, (road racing, urban, hybrid), you just need one- the right bike for every road and need. That's why calling these new bikes "gravel specific" is probably a bad idea. 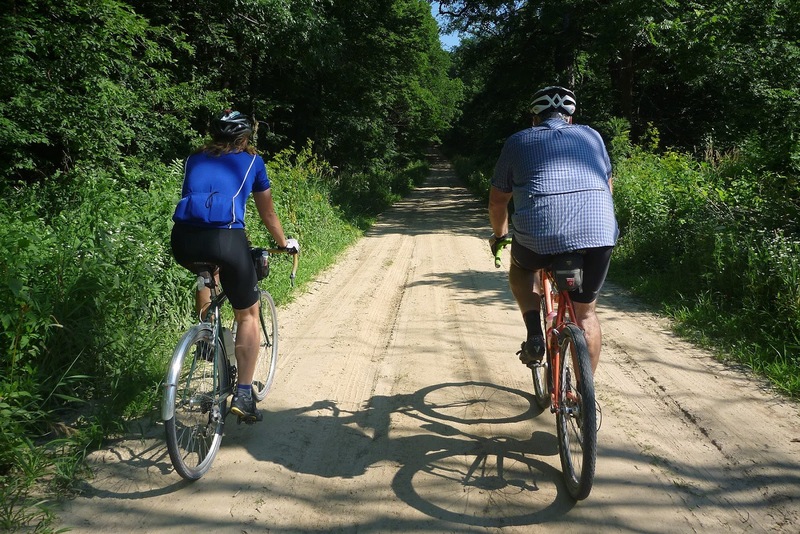 Just like calling a fat bike a "snow bike" automatically limits the imagination, so does "gravel grinder bike". I'm thinking "all road" is better, but maybe there is a better term than that. Whatever it is, these new bikes coming out, (and that are out), deserve a much wider audience. As I rolled up the hill to the parking lot meeting spot, I spied a rider under the shelter there. It turned out to be Mike. I had thought Mike was doing an event, but I was wrong, it is next weekend. We waited until it was time to take off, but saw no other riders. A twosome it would be. Slowly we rolled down the embankment and onto the tarmac for a few blocks before turning left onto gravel. Mike announced that he had been in possession of this fine titanium bicycle he was riding for several months, but that the ride Saturday was his first ride on the bike. So it was a special maiden voyage 3GR as well. The brisk wind was right in our faces as we strove against it going Northward. We discussed how it had been a Northerly for most of Mike's 3GR attendances. The wind on the ride was steady, at least, and not too gusty. The gravel was a bit pervasive. Many times it was across the entire road surface. No good, smooth lines except in rare instances. This was not a good thing for the 33mm tires I was running. many times I felt as though I was "surfing" more than riding. The ol' Black Mountain Cycles bike is stable though, at lest I had that going for me. The flowers are spectacular in the ditches now. The ride was good, and we were not worn down by the North wind, but when we turned our backs to it, we were grateful for the easing of the effort. In fact, we almost felt guilty because it felt like cheating. Along about the time we were headed back South, the conversation had turned to bears on the Tour Divide route that Mike had just finished. He hadn't seen any, but we both had heard about others who had. Then not more than a few minutes later, a brown blur came racing across the road from my right. It was a squirrel, and it just barely missed my front wheel! I turned to my left to see it strike Mike's bike near the back edge of his front wheel and the squirrel jetted upward. Now at this micro-second in time, my thought was the squirrel was going to get jammed into the fork crown and cause Mike to have a big wreck. However; the squirrel actually bounced backward a bit, clearing Mike's bike, but it flew up into the air, cartwheeling and spinning up to our head's height! Then it hit the road and sped off in a flash. Mike and I were flabbergasted. I was amazed he wasn't downed in a bloody heap. We probably laughed about that for the next mile and a half! That wasn't the only wildlife sighting either. We had a big doe early on running up the road ahead of us, and we must have seen a half a dozen Red Tailed Hawks along the route. I'm not sure if the colder weather is making the animals restless, but they were on the move yesterday. Well, it was a great ride, and the first where I have felt better in a long time. The next thing ya know, there will be fat bike recum....oh! Of all the posts over the past week, the ones with fat bike content were the hottest ones here. Obviously all the new entries have stirred up a lot of interest, and if you think about this, it makes sense. 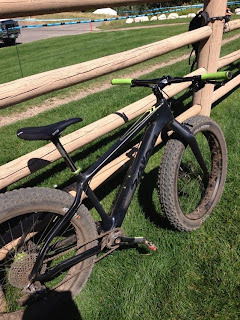 Until recently, there was but one fat bike tire. Now there are several models from three different sources. (Four if you split off 45NRTH from the Surly stuff.) Soon there will be at least two more offerings, and possibly more. I suspect this reminds many, as it does myself, of the early days of 29"ers, when a new tire intro was met with a huge buzz. Heck- now days a new 29"er tire hardly dents anyone's consciousness. 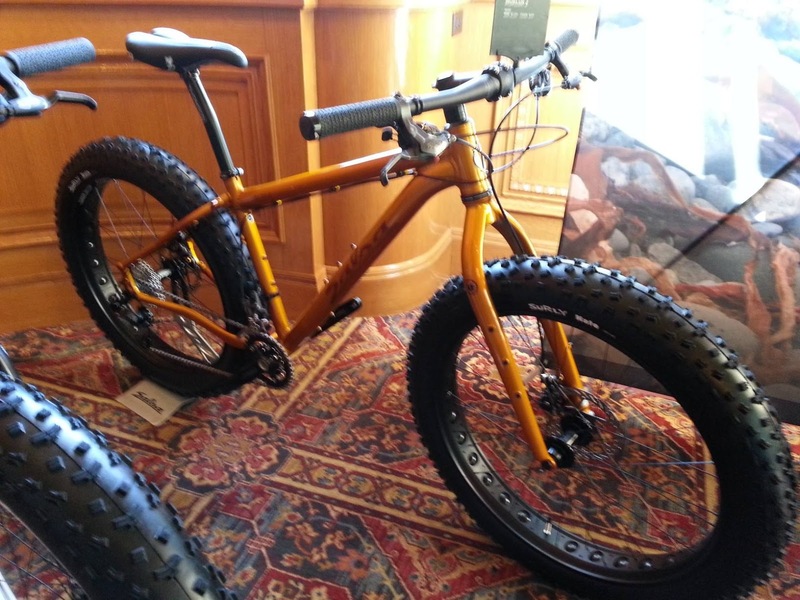 Maybe some day fat bikes will get to that point. But they are not there yet! Then there is the interesting debate on what rear spacing is going to shake out at. Specialized and 9 zero 7 have put a stake in the ground with 190mm hubs, and Fatback also offers them now. Everyone else is pretty much sticking with 170's, with the exception of Surly, but, ya know........they don't give a rip about what everyone else is doing and how they do it. They are their own deal. So I don't think that Surly factors into this anymore. Finally, there is the Rock Shox suspension fork that is due this Fall/Winter which- when it comes out, will be much like it was in 2005 when Fisher put a Rock Shox on a 29"er for the first time. I remember that well. (Sniff! I still have my Mark 1 Reba in the basement!) There will be a bum rush to get a hold of one. It's going to be interesting, and you have to wonder, "Can Fox or Manitou be far behind?" "I think the easiest way to look at this would be to say "Why have a road bike for crit racing when your CX bike can do that easily?" Hopefully, you see where I am going with that,because the gravel road races call out for a slightly different animal, (if you want to go fast, be in control, and be less beat down), than what a CX bike is these days"
So, no one needs a gravel specific bike just like no one needs a time trial style bike for triathlons. I mean, a road bike can do that just as well, right? Right, only a time trial bike is better. Same deal with bikes tweaked for gravel. It's just that most folks have never ridden a gravel specific bike to know one way or the other. Now that will start happening next year. (The Raleigh's come out late 2013, so I've heard), and obviously Warbird owners can attest to this already. There are going to be more of these bikes out there, and I am hearing a "major player" is going to step into this genre as well. It's going to happen, and well......then we'll see how folks like "gravel specific" road bikes. The new 2014 Fargo models drew some fire for their changes from 2013 as well. Many do not like the front mounted braze ons for the Anything Cages on the forks for 2014. Some are grousing that it went to a 100mm sus corrected fork length, (which I find weird for a few reasons), and some don't like the new colors. Touring bikes, that can handle traditional touring gear, and that can do a bit of off pavement action describes what the Vaya is for. The Vaya isn't for rough single track though, and shouldn't be. Try dragging a bagger set up through rough single track, (where big, meaty tires are really the best), and see what I mean. I like the cut of the Fargo's jib now. It isn't anything like the Vaya anymore, which is as it should be. Previous Fargos were pretty much fat tired Vayas, and to my mind, that doesn't make much sense. But maybe having a drop barred El Mariachi doesn't make sense either to some of you. All I can say is that a drop bar mountain bike has a place in my stable and I look forward to acquiring the new 2014 Fargo in some form or another. I like the 100mm suspension fork capability, and a new one would have that suspension fork, if I get one. I like the Alternator drop out, because I like single speeds, but I maybe would set this up geared. At any rate, I have that option. I also would have the ability to bail myself out of a derailleur failure out in the field by going single speed. I like the slightly shorter stays, or being able to lengthen the back end with the same Alternator set up. And I like Bomb Pop Blue. So, yeah.......I probably will look very hard at doing that for 2014. 3GR: Yes, it is happening tomorrow from Gates Park Swimming Pool parking lot on Donald Street at 8:30am, unless it is raining. Hope to see some of you locals there. And with that, have a great weekend and ride those bicycles! Time To Calm Down A Little! Hey, it can't all be new product reveals and new model year info everyday around here, ya know! I gotta tell you regular readers that the last week or so here has been nuts on this blog. Numbers have been pushed into record territory. Why just yesterday over 3,000 folks hit up this place. It wasn't all that long ago that it took 11 days to get over 3,000 hits here! But that can't last and now it is time to calm down around here for a bit and get back to some "regular programming". Yesterday was about near perfection all the way around. First it started off with my great family, as usual. Then off to ride with Jonathan and James from the shop where I work. They were looking for a ride to Ingawanis Woods, I have a "Truck With No Name", a bike rack, and time off, so we all hooked up to get our dirt on. James was a rookie up there and Jonathan had not been on the newest section of trail yet, so we had a good time checking out the trails and riding the awesome Ingawanis Woods single track. Only 1.5 crashes, and no major catastrophes, so I counted it all up as a success. Then we had a lunch date back at the shop. Then back home for pizza and ice cream cake, (what else would a 10 year old boy want? ), then he and I settled in to watch the first dirt race NASCAR has held in 43 years on T.V. It was fun, and the end of the day was bittersweet. One of those days that you didn't want to see end. So, there ya go. Nothing "new", shiny, or groundbreaking for you bike freaks, but a darn good day, and a nice way to take a break from all this News Season madness of late. With the advent of gravel racing and the increasing participation in this niche, many manufacturers have been taking a hard look at putting out product to attract the dollars of dirt road riders everywhere. 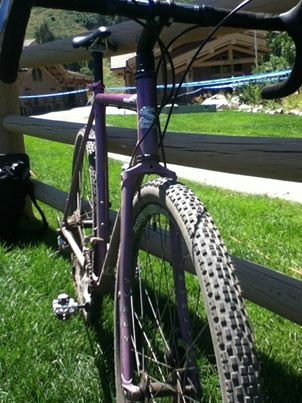 Take Salsa Cycles Warbird, or Clement Pneumatics gravel tires as an example here. 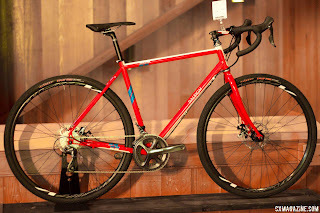 I've already detailed a bit of info on Surly Bikes "Straggler", which has a very gravel bike oriented look to it. (See here) Now I can speak openly about a project Raleigh has been cooking up for about a year now. 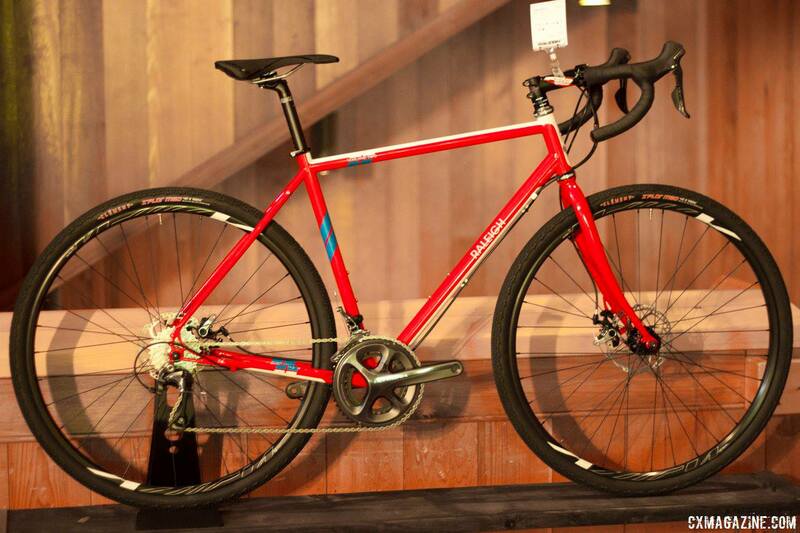 The Tamland gravel specific racer. Cyclo Cross Magazine busted open this story yesterday on their Facebook page and scooped some details from Raleigh on this new rig. Made from Reynolds 631 steel tubes, sporting TRP Spyre mechanical disc brakes, and a brand spanking new Ultegra 11 speed group, this bike is not a half-hearted attempt at trying to jump on a bandwagon and pry some dollars from a niche group of cyclists. It looks like Raleigh may have done this one up very well, in my opinion. For one thing, Cyclo Cross Mag says this bike has Clement MSO's on it with "plenty of clearance". Their words, not mine. If so, this bodes very well in that department. Obviously, you can also see that the chainstays are a bit longer, for stability and tire clearances, and it sure looks as though that bottom bracket is sitting low, which if true would be a really good thing as well. This was the bike I was hoping Raleigh would put out there, if it is what I think it is, and if so, it will be a fine handling rig. That's about all I can say now. There is a lot I like about it so far. To be completely honest, Raleigh actually called me up and picked my brain one day. 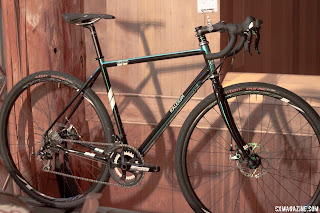 I spoke on a conference call with their team that worked on this, so if they took my advisement and made it reality, I guess I'll be proven wrong or right on what I think a gravel bike should be. But I do not know how much of what I told them they took to heart, so we'll have to see there. At any rate, the name: "Tamland". I'm not a movie buff, so I Googled it. Wow! Maybe us gravel grinders are a bunch of freaked out, mentally challenged weirdos. Either that or we're crazy like a fox! UPDATE: For more specific information on the Tamland, see Cyclo Cross Magazine's article on the bike here. 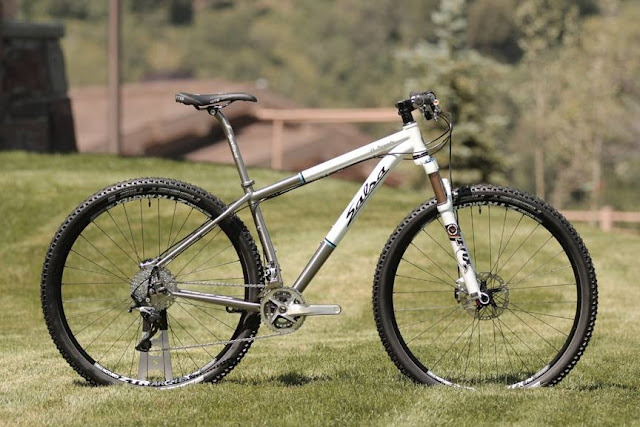 For 2014, Salsa Cycles has decided to change the look of their titanium bikes by painting parts of the frame on the different titanium offerings they have. The Mukluk Titanium gets this awesome looking lime green front end with some green ano accents. This is offered as a complete and as a frame set. Of course, the Mukluk Titanium continues with the overseas manufactured, formed, triple butted titanium tubes and Alternator drop outs. These drop outs should allow single speed set ups or use of Surly's biggest rubber on 82mm rims. The bike will feature a 2X10 drive train,and if you do use the really big rubber, you may have to modify the cassette for full use of both rings up front. It'll be close, from what I've read, but doable. 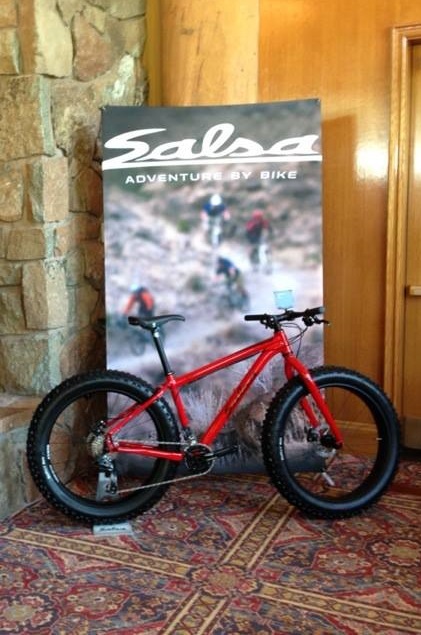 Good to know you can do that, since this is the ultimate expedition fat bike from Salsa. Salsa comes back with the Mukluk 2 in a Metallic gold this year. The bike retains the basic layout from last year with the exception of the fork. This is the aluminum Beargrease fork with Anything Cage mounts, which should cut a lot of weight out of the front end of the bike for 2014. The Muk 2 is also available as a frame set. The Mukluk 3 continues on and will come in this brilliant red or with a matte black scheme with white rims. Both come in aluminum and will feature the Alternator drop outs. There will be no frame sets with the Muk 3 color schemes. Big size range available here though, from XS to an XL, so the bike can fit a wide range of folks. All Mukluks feature trigger shifters now and will come shod with Surly Nate tires. The Mukluk 2 gets Holy Rolling Darryls while the Mukluk 3 gets the non drilled Darryls. So, with the new Beargrease carbon bikes, Salsa has moved into the upper end of the fat bike market and have the widest range of fat bikes available in several price points. The low end has "risen" a bit. Expect MSRP on the Muk 3's to be a tick higher than last year's prices, but that still represents a heck of a deal when you get Alternators and a proven package. Big news on the Fargo. It finally gets the Alternator drop out! This, in my opinion, was one of the only weak spots on a solid drop bar adventure bike. But that isn't all here. 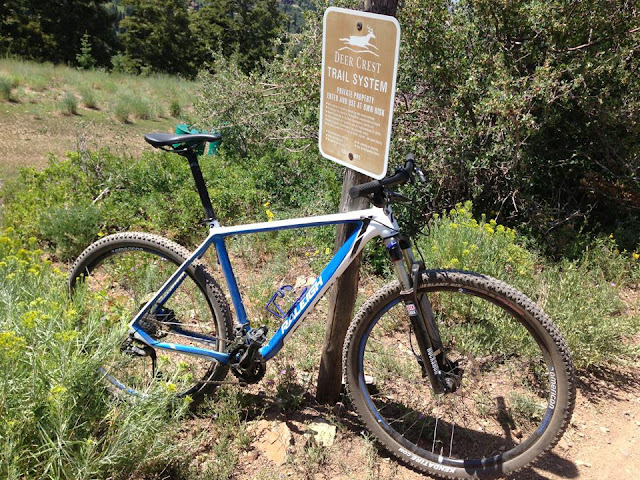 The blue Fargo is a Fargo 2, and it sports Salsa Cycles new carbon Fargo fork. Featuring a suspension corrected for 100mm fork in carbon with Anything Cage mounts in the new forward position for better load stability and durability, this brings the Fargo up to snuff. Salsa also tweaked the rear stay length to be a bit shorter to pep up the handling a bit as well, but you can still get that longer, stabler rear with a move on the Alternator drop rearward. Of course, your IGH and single speed talk is all welcome here as well. Also, there are more Shimano bits, and no bar end shifters on the Fargo 3, (shown in Mustard here), which should please a few folks. All STI style now! 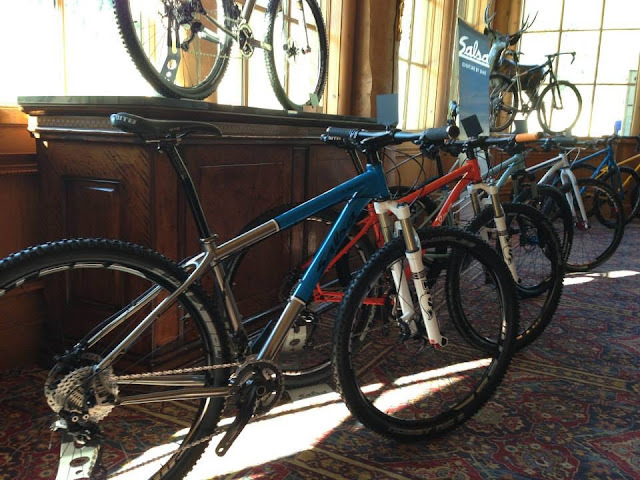 The El Mariachi line up reflects Salsa Cycles move to cover more of the high end market with two offerings in titanium. Both will feature the partially painted titanium triple butted and formed frames made overseas. 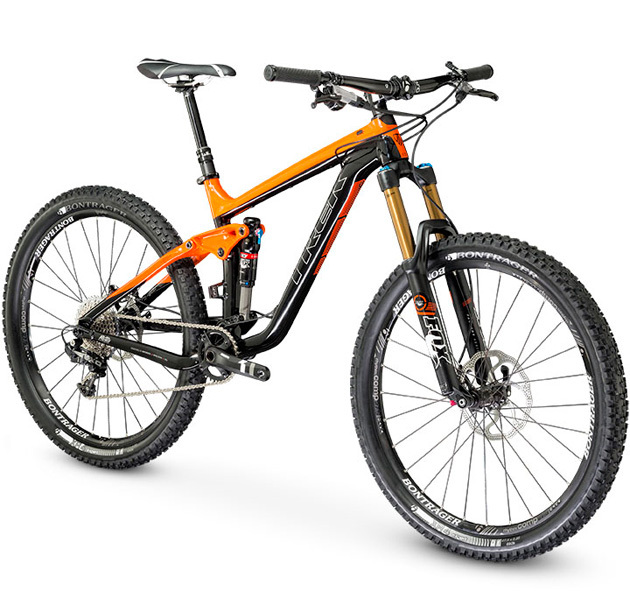 The top of the line El Mariachi will come with Shimano XTR and features top tier racing equipment. Of course, the Alternator drop outs are featured throughout the El Mariachi line up. Salsa is maybe one of the only remaining companies, ( Specialized, and Raleigh as well), that retain a nice single speed 29"er in the line up. The Limited Edition El Mariachi SS comes in a white with tri-color top tube color scheme and a nice parts spec. You'll note the slight bend in the seat tube, which reflects Salsa's shortened stays on the El Mariachis for 2014. 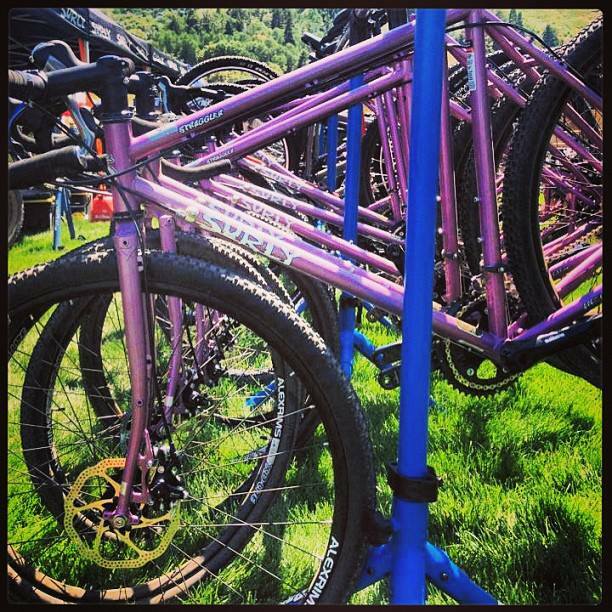 First up we have the Beargrease, which is all carbon these days. Through axles on each end mean special hubs, and the headset is an inset one as well. 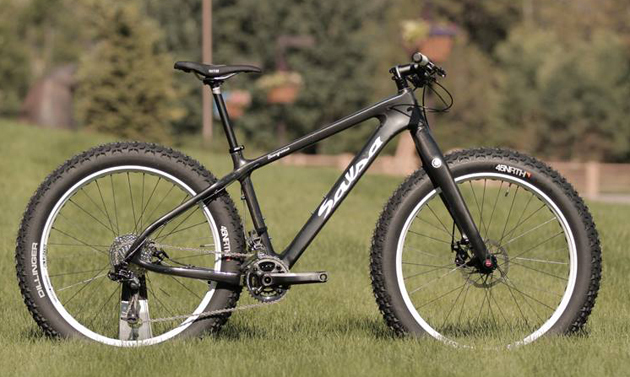 This is meant as an all-out, no holds barred racing bike with really fat tires. The matte finish is highlighted with green striping and grips but otherwise is very subtle in appearance. With the XX1 spec, this bike is a claimed 23lbs or so, depending on the size. Oh- the sizing! Sm, M, L, XL. The bike is spec'ed with no strange, weird weight weenie stuff too, which makes all this all the more remarkable when you look at the complete weight. The weight could go down even further with some tricky parts swapping. With all this "raciness" and ultra-low fat bike weight-weenie delight going on, you just know it ain't gonna be cheap. And it isn't. 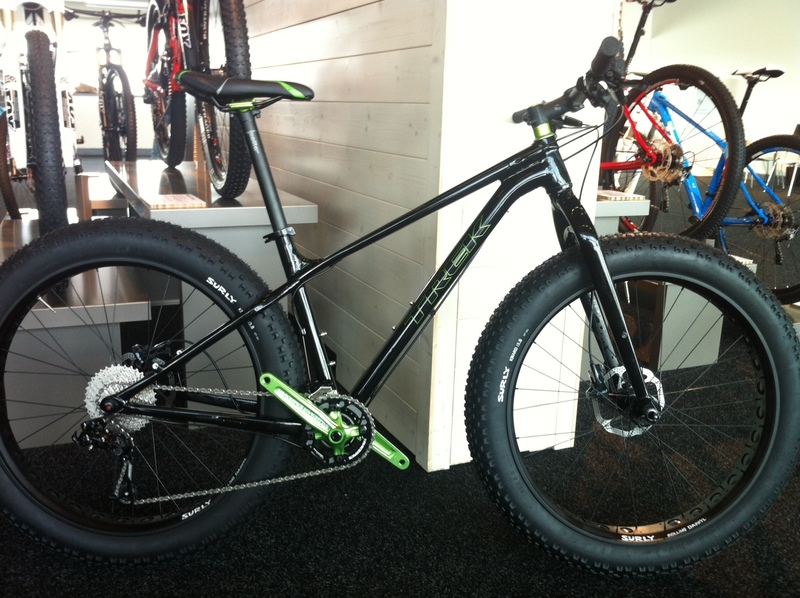 Expect a well north of 5G retail price on this fantastic fat bike. There will be a second tier model as well as a frame set, but even the frame set won't be cheap. In fact, it is more than just a frame set. Seeing as how the frame requires through axles, the frame set price, (about what a Muk 2 complete retailed for last year), comes with through axles, hubs, head set, and seat collar, along with the immense carbon fork and frame. 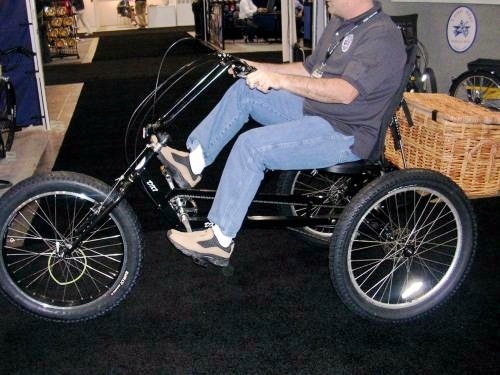 I don't see spec or listings for a Beargrease aluminum frame, so this looks like it is it if you want to get into a lightweight, fast fat bike. Now they have not had an Instigator in the line up for a few years. Well- it is back. I am not so much interested in the Instigator as I am the tires they made for it. (Or was the frame made for the tire? Hmm....) Anyway, here you have the perfect "fat-lite" tire. This is the sort of thing, ( I hope), that will fit on my "Ultimate Big Dummy" bike build. (Someday, don't ask just now.) 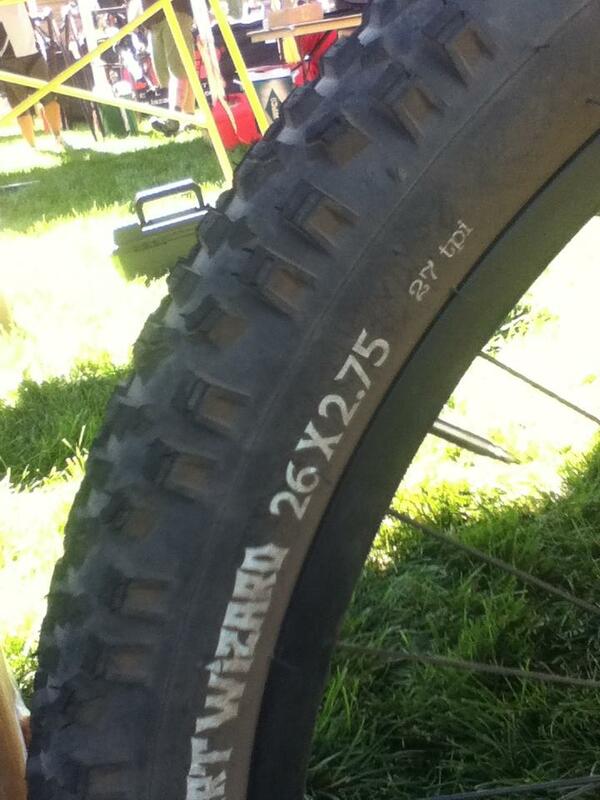 I'm sure Surly has other ideas for this tire, especially since it is called the "Dirt Wizard". I know a lot of folks will be wondering why the Instigator wasn't a 27.5"er, or a 29"er. The Krampus is pretty much the big wheeled version of this anyway, and.....well, did you notice the irony in the Dirt Wizard's width on the hot patch on the tire's sidewall? My guess is that 27.5"ers will shoe into that frame just peachy, if that's what ya want to do. The "ECR", above, is an interesting take on 29+. I said it when we first learned of the Krampus: 29+ is a great size for bike packing. Well, obviously Surly was way ahead of me in that thought, because here they already have the ECR. Notice the Troll/Ogre dropouts? Notice that this bike has a front derailluer? Notice the Anything Cage mounts on the front fork? Notice the Jones Loop Bar, (which will come stock on this rig)? Yep! I think this would be a great, durable, versatile bike packing rig, sans suspension, if you can live without that. I think a Rohloff equipped ECR would be a stellar touring-at-a-comfortable-pace off road rig. Now for the other tire I am excited to see coming down the pike. (Well, depending upon some details, that is), and that is the Knard 700c X 41mm tire. This tire will be spec'ed on the new Straggler bike from Surly, which appeared here yesterday. The 700c X 40-ish tire size is great for gravel grinding. (One of my favorite tires, the Clement MSO, comes in this size range) If the Knard 700 X 41 comes in a 120TPI version at some point, I think it may become a great gravel tire for events like Dirty Kanza, Odin's Revenge, or any other event that big, floaty tires would be an advantage for. Surly may not have a 120TPI tire now, but I think that a 27 or 60TPI tire may be too stiff and heavy for many gravel grinders. So, I'll wait to see what Surly offers here, but a 700 X 41mm tire sounds just lovely to my ears right now. Obviusly, Surly doesn't go in for tubelessness, but I would sure like to see a tire in this size class be tubeless. Whatever- at least there is progress in the tire choices for creative minds to put to use these days. Surly may not have the technology in their tires, (tubeless, dual compounds, higher quality), that others do, but they seem to hit on all cylinders when it comes to sparking imagination and adventure in riders out here. I like that, and I support that effort. Saddledrive: The dealer only event that Quality Bicycle Products puts on at their Ogden, Utah facility, is kicking off today. No doubt all the big news fro Salsa, Surly, and the other sundry QBP brands will be spreading wide and far across the web today. Much of the Salsa doings I have known about for months, and it will be a relief to be able to talk about it all openly here soon. But for now, here is a tidbit from Surly that I find quite interesting. 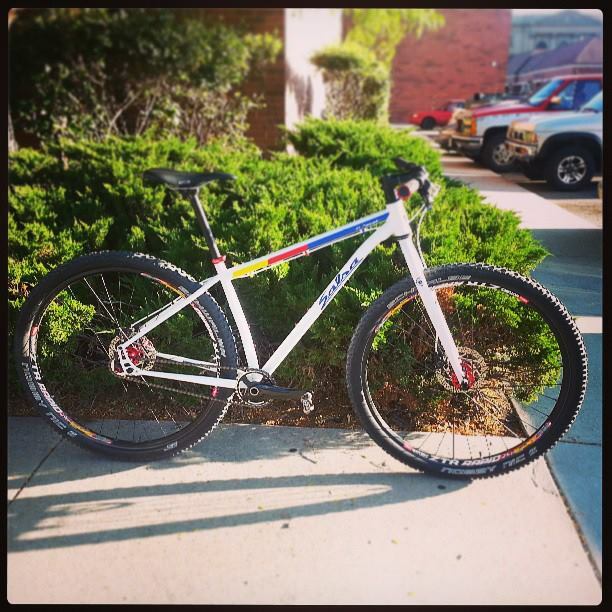 There have been very well planted "spy photos" leaked over the past two months of this bike dubbed the "Straggler". No doubt, Surly will have some crazy story behind the name. 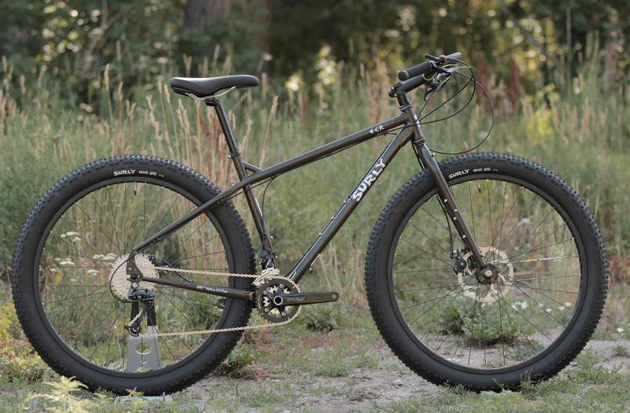 What for Surly has to be a "no brainer" bike to finally put out, the name is maybe the biggest news after all here. 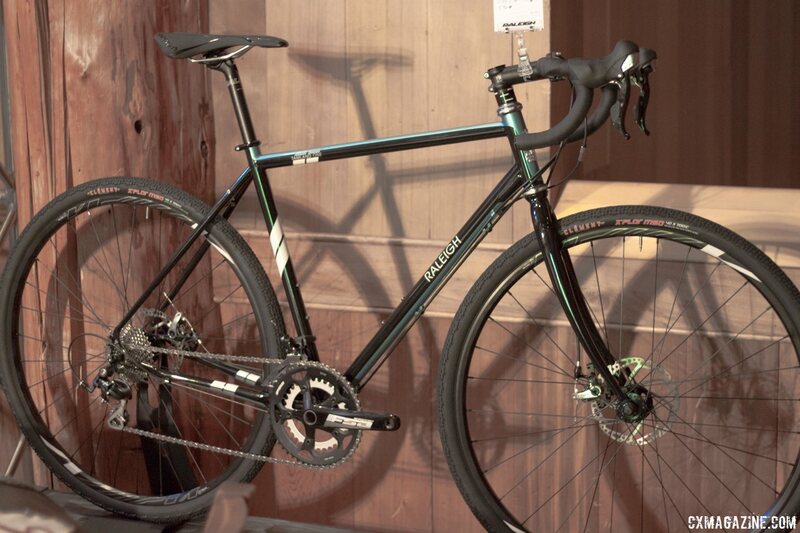 Obviously, the profile of this bike calls out Surly's long running and very popular model, the Cross Check. The obvious name for this bike in people's minds will be "Disc Cross Check", but less obviously, Surly doesn't quite see it that way. Or maybe it is obvious that Surly wouldn't see things the way "we do"? Hmm........well anyway. I'm also sure there will be a Surly blog post explaining this in the typical Surly manner. Stay tuned for that, or not....... For me, none of that matters as much as what Surly shod the Straggler with. I've seen an earlier image that looks like the tires are a form of Knard, only skinnier yet. If so, this might be a pretty cool tire. I'm sure later today this will be confirmed or we'll find out it is something else. Michael was a 1st timer on the ride. Okay, the bike was dialed in and the big question was would I be ready? This- whatever it is- that I have that is dragging me down was hitting me hard on Friday. The legs felt like cement and later on they were in an achy state of pain. I strayed from drinking anything but water all day, and I hit the hay earlier than usual, just to insure I would be in the best condition I could be in. All things considered. A decent breakfast was consumed and I set out for the start feeling "okay". No real big aches or pains and I felt alright pedaling. I got a text from Jeremy saying he would be there, so I knew at least one rider would be showing up. As I sped along downtown Waterloo's streets, I became aware of another kitted out rider approaching. Odd.....usually seeing another cyclist in the downtown area means a person in civies on a ratted out rig or a mart bike. But this individual was obviously on a nice rig. Then I suddenly realized it was Michael, one of my, (sometimes), coworkers at the shop. We exchanged greetings and off we went to get to the start. We weren't there long before being joined by recent Tour Divide finisher, Mike Johnson. Then a few minutes later, Jeremy rolled up, out of breath, since he was pinning it to make the start time. Great googly-moogly! A foursome! The day was cooler, with less humidity than we had experienced in the previous days, but it wasn't what I would call "cool" weather either. It was really about perfect. The roads were dusty, and we hit many patches of fresh gravel. The early pace set by Jeremy was blazingly fast for a 3GR. I figured he was in a hurry to get back home for some reason or another. Mike stated at this point that his "go" button had been disabled! Well, 2700+ miles in three weeks will do that to you! Eventually Jeremy came back to us and as he engaged Mike in conversation about Mike's Tour Divide experience, the pace eased a bit back to "normal" 3GR speeds, which eased my mind a bit. I wasn't too worried about the bike, but I was concerned about myself and how I would respond to a big push like that out of the gate. So far, so good on all accounts. The bike was doing well, as I said. It had a big ring that I figured would be too big, (48T), and a middle ring I figured would be too small, (34T), so I was concerned about how this would play out on the ride. I pretty much stuck it in the big ring the entire ride, besides one steep hill where I tested out all three selections. The ride of the bike is smoother, by a little bit, than the Black Mountain Cycles bike, but I can tell the bottom bracket is higher and there is something about the way the rear triangle works that makes you pin your weight on the front wheel more, which sometimes resulted in a push on the looser sections. Overall it is good. Just a wee bit "off" in a few areas. More riding time will set in more impressions to be shared later. A rare one of me, by Jeremy. Okay, enough about the bike. I was going along pretty well once past Denver as we took the left toward Ivanhoe Road. I seemed to be getting settled in, and was actually feeling okay on the bike. The legs were holding up, and even Jeremy noted that as we were riding. Eventually we reached a point where it made sense for Mike to peel off and head back to his home in Cedar Falls. He was obviously still feeling the effects of TD on his system, as I caught glimpses of him yawning on his bike a few times during our ride. I imagine it takes a while to recover from something like TD. Eastward and then south on Burton Avenue and back into the city. I was still going well and thought maybe this was a sign I was recovering from the sickness. Jeremy peeled off at a street where it made sense to him to head home and Michael and I finished out the ride. 40-ish miles and done in 2 and a half hours. Not bad! As I sat at home,I suddenly felt very tired. Well, maybe I wasn't recovered after all! I ended up getting cleaned up and then taking a nap for a bit. Pretty zapped the rest of the day too. Maybe the "Power Of The Mutt" got me through, or I was just lucky enough to ride exactly as long as I could have before falling apart. I don't know, but the bike- that was a success. In my last post on the Gravel Mutt yesterday, I said I was going to have to swap out the head set. I fully intended on getting that swap completed Friday afternoon after I got off duty at the bike shop. As I undid the fork and what not to get at the head set, I was thinking about how odd it was that the head set did not work. It was just fine when I used it a long time ago in an older road bike I had. Why should this bike be any different? I aimed to do a bit of investigative work as I tore down the front end of the Mutt. The crown race was tight, the cups were tight, so where was I getting movement from? I knew the upper race was moving in the upper cup, so if the cup was solid in the frame, then it had to be the race and bearing. I figured maybe the bearings were shot, but they seemed okay. I put the bearings in the cup and could recreate the knock. Hmm.......maybe the cups were not symmetrical. Maybe I had the upper cup in the lower position. I tested my theory by putting the fork in the frame upside down. The crown race set into the cup, (which was in the upper position), like a glove. Yep! I screwed that up! Out came "The Rocket Tool". The "head set cup removal tool" looks like a Russian space rocket to me, so I always call it "The Rocket Tool", and after a few easy taps, and another hand press fitting followed by a rubber mallet for good measure, I had the cups installed correctly. Everything was assembled again, and then a test ride to verify that everything was good. I've been going through a round of swapping out tubeless tires on several of my off road rigs lately. It is a pretty dialed in process now days. You either have a Stan's, or Stan's-like type rim that you put a non-tubeless tire on and convert it to tubeless, or you have a UST based, or UST-like type rim which you put just about everything else tubeless ready onto. At least things are shaking out that way, if they are not quite there yet. For example, I set up some WTB Nineline tires on Deore XT wheels, and all of this is UST based product. You mount the tire, add your sealant, and pump it up with a floor pump. Pop-pop! Go for a ride, you're done. No "shakey-shake", no special goo on the rims, nuthin'. That's "pretty dialed", if you ask me. Of course, some set ups are still a bit more fussy than that, but not a lot. With a few exceptions, tubeless systems for 29"ers have come a long, long way in the last few years. This isn't the case with road tubeless. Not at all. The Bontrager system looked promising. TLR rim strip, new sealant, and tires that were purportedly dialed in and I figured the system was a no-brainer. I know the TLR system in and out from having used it since 2007 on 29"ers. It works great on that side of things. However; a customer came into the shop, asked if we could see why his rear tire kept leaking down. I saw sealant all over his spokes. Weird! I aired up the tire, checked for leakage with soapy water, and what do ya know! Thousands of tiny pin hole leaks on the sides of the casing. Double weird! If the tire had enough sealant, and the tire is indeed a TLR design, (which it was), there is no way it should have pin hole leakage. A non-tubeless conversion, yes- but not a tire meant to be tubeless. I dinked around some more with it, but quickly came to realize that this tire needed warranty action. Come to find out that Trek has asked that all TLR road tires be warranted, and you can not get them from Trek as of now. So nice of them to let us know that. So now you know, and road tubeless goes back to the drawing board again. So, I am going to go with the Campy head set I have , I guess. The original head set would work if I still had the upper bearing/race! I don't know where that got to in all of the hullabaloo when I tore apart the 520, and I have not seen it around. So, barring any crown race sizing discrepancies, the Gravel Mutt should soon be sporting a nice, shiny new Athena head set. If, for some reason that does not work, then I will probably source some cheapo steel head set to just get the thing out there and ridden. That Brooks saddle is begging to be broken in! I don't know if I will get this done in time for this weekend's 3GR, but I am going to try. I have ridden it a bit and it should be an "okay" rig at the least. We'll see after a good, proper long gravel ride happens. Surprisingly, this bike seems to have a taller bottom bracket than my Black Mountain Cycles bike! However, the head angle seems slacker. I haven't measured anything yet. I will get around to it soon. My iPhone 4s has one of them fancy angle finder ap doodads. Guess I'll be putting it to use! (L-R) G. Foster & GT -Image by M.Lemberger. My wife, who is an RN and works in the medical field says that I have/had a viral sickness the last week or so. Okay- she isn't a doctor, but she usually knows her stuff. I described my malaise over the past couple weeks and what happened at GTDRI and she flatly stated, "Well- you've got a virus!" I know I haven't been "right" in a while, but last weekend and the first few days of this week were downright tough. Of course, this heat isn't doing me any favors either. So, I've been taking extra rest, only commuting on the bikes, and Saturday will actually be the first "big" ride I've had since last weekend. Hopefully I will do okay. So, there will be a 3GR Saturday, and we'll go from Gates Swimming Pool parking lot again, if anyone else is interested. may as well just keep riding from there since I've been doing that all year anyway. 8:30am is the time, and route from Gates rounds out to about 30 miles. More if you ride to and from, so you could get a decent mileage day if you want. That's all. Hope everyone has a great weekend of riding. 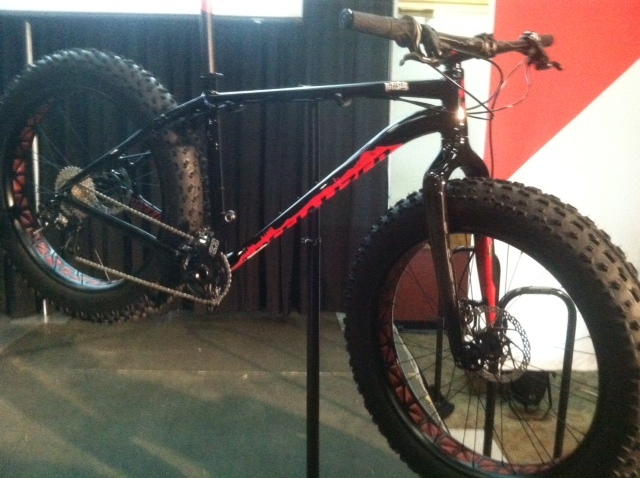 First up- the Specialized Fatboy. This is an aluminum and carbon fiber forked rig that will come in at two spec levels. The deal here is that Specialized says it is for "snow racing", and so it has the more radical hub spacing of 190mm rear/135mm front. Kind of a surprise to me there, but it will easily clear the biggest tires out there now and Specialized claims it will clear a 5"er. (Do they know something we do not?) At any rate, what you see for tires here are not what the bike will come with. Specialized is doing their own tire. That's really the biggest news to my mind here. Specialized says it will be a tire based upon the Ground Control, (a great tread pattern for all-around dirt riding, by the way), and will come as a 120TPI tire in a 4.8"er width. That's as big as it gets now. Specialized also developed their own branded hubs and rims for this bike. They are going with a 90mm rim that has no bead hook, just like their upper end Roval mountain bike wheels. If the bead seat is a big enough diameter, this should make their tire spread out even that tiny bit more which should get that Ground Control Fatty just about as wide as a Bud & Lou on a Clownshoe 100mm rim. Bonus: The rim weighs 795 grams too, which is significantly lighter than a Clownshoe rim. Well, I knew for a few months that Trek was prototyping fatbikes up in Wisconsin, as an eyewitness who was there on other business noted them being scurried in and out of doors there during his visit. When would the leakage occur, was the only question. 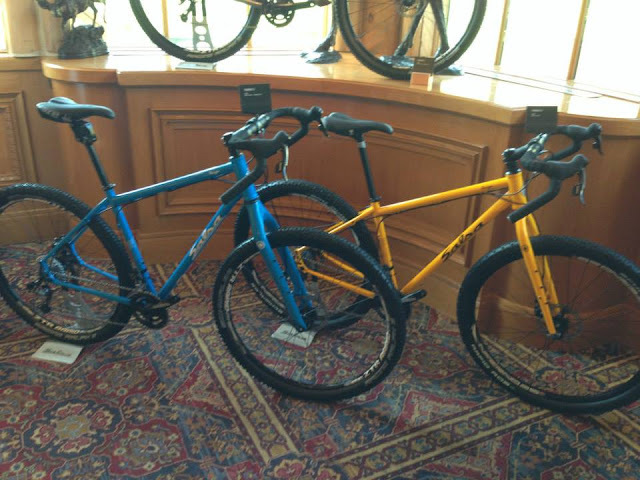 Well, over in Europe Trek is doing its first Trek World showings to dealers and one of the U.K. lot took a pic and posted it online. Leak detected! There is a rumor floating out there: (Note: I said "RUMOR"- the following is not at all verified by Trek or Salsa officially): The rumor states that Salsa's Beargrease carbon bike is built by Trek. IF that is so, then a connection to Surly componentry makes sense on the Farley. (NOTE: I have been informed this rumor may have started with an errant April Fools prank. So there is that.) Otherwise, I would think that Trek would use a Bontrager branded rim and tire, and perhaps like Specialized, their components are not yet ready. Either way, this looks like an entry level fat bike offering from Trek which will give Salsa fits as far as trying to find room on dealer showrooms. It must be stated again that little yet is known about this Trek, so other than the fact that it is a fatbike, everything else here is still in the shadows. I expect we'll all know the truth in a few days though. What Does It All Mean? : There is much dusting up on the forums, as you might imagine, about what all of this means. Some say this is good, some that it is bad, some say fatbikes have "jumped the shark", and others say they are only getting cooler. Many folks lament the "big guys" getting into their deal, but on the other hand welcome the proliferation of parts that more models in the marketplace bring to the table. It's also hoped that this will help drive prices downward on bikes and components. My Take: I really do not care about what is "cool" or what has "jumped the shark", because if that mattered, no one would even think to ride a bicycle these days. So I leave that for the punters to dissect. As for the "big companies" getting into this- Obviously dealers of these companies have been exerting some influence as they see QBP brands Salsa Cycles and Surly increasing productions and choices every year and still running out of product. This all during the "off season", when Trek and Specialized dealers would be killing for a bunch of $1800.00 sales in November. To my mind, this is the "real reason" these bikes are seeing the light of day. But the bikes- what about those? Well, I do not know much about the Trek, so I will withhold my opinion only to say this: It doesn't look all that special. It's merely "okay". But then again, I could be easily missing fine details that would change my mind on this. The Specialized is very interesting if only because they have actually expanded choices in fat components. The tires should be amazing. Specialized does a pretty good job with their tire line, and I have high expectations for this 4.8"er. The rims are also intriguing, and if Specialized is smart, they will offer those rims and tires in the aftermarket as well. My hope is that Trek is not just recycling more of the same ol' Surly stuff on their bikes. Nothing wrong with Surly, but Trek is missing an opportunity to advance fat biking choices and make their product more than a "me too" bike if they do not pursue their own tires and rims. What is that you are hearing? That's the death rattle of the 26" wheel for performance mountain biking, that's what. 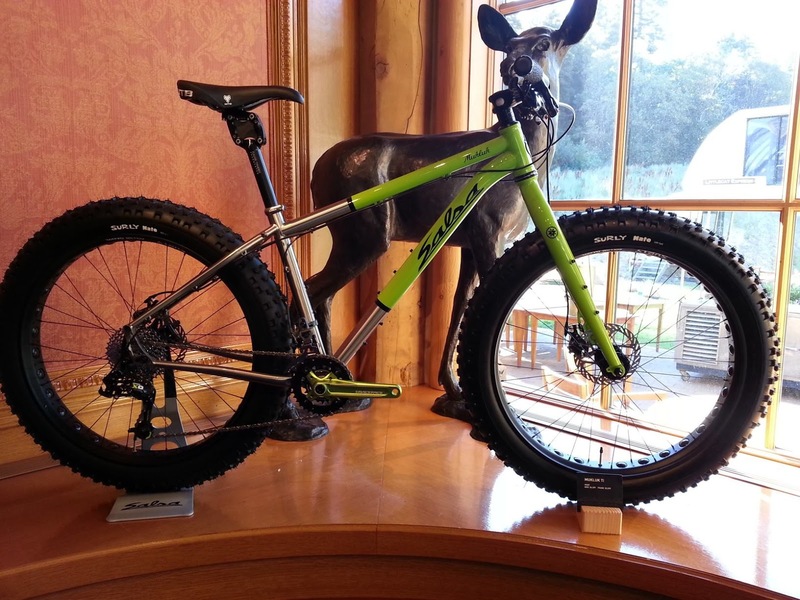 Manufacturers continue to scramble to "not miss out" on the "next big trend"- 27.5 inch wheeled mountain bikes. The latest brand to push 26"ers to the curb is Trek, who just announced six new 27.5"ers to their 2014 mountain bike line up. These bikes are all longer than 150mm in travel, and make perfect sense for a smaller wheel, which keeps the front end height in check, for one thing. It doesn't really matter that these have slightly bigger wheels, what matters is that 26 inch wheels will probably be gone from performance mountain bikes by 2015, definitely by 2016. Every company will move to 27.5"ers in long travel bikes, and many will have XC hard tails in this size as well. It's not "if" it is going to happen. It's a matter of time now. This year Rock Shox and Fox offered all 2014 product across three wheel sizes, but I bet for 2015 many 26 inch options will disappear. When that happens, it is a defacto death strike to 26" wheels on high end, long travel mountain bikes. The rest of the market will follow suit. It is odd to think that the once "only wheel size" and predominate performance choice in mountain biking for almost 35 years is going to disappear, but I believe that is what we are witnessing here. Just wait till all the mart bikes start showing up with 27.5"er wheels! The group, now numbering 24, rolled on to Maquoketa's streets a bit after 8am and literally fell upon the Casey's General store like a horde of locusts. I was stopped before walking in by a bit of conversation, and by the time I did get in the breakfast pizza had been wiped out and the line was ten people deep at the cash register. Well, fortunately for me there was a quick witted employee there that had seen the carnage happening and was "johnny-on-the-spot" with another breakfast pizza within minutes of my entering. Nicely done! Ari and I gave the group plenty of time to digest and use the facilities before we were to split into two groups. The"short option" folks would go with the Bonk King back on a parallel route to what we used coming out and end up with 65-ish miles and at the starting spot so they could easily get home. The Bonk King stated that he was not in a big hurry to take the seven riders with him and that we should hit the roads first. We took his advice and headed off to some more gravelly goodness. One thing we didn't do- and we ought to have done- was to count how many left for the long route. Well......we didn't, and it turned out okay. But this points up my inexperience with dealing with such a large group ride where you have to make sure no one gets dropped. Then I was starting to get really worked and really hot. I was plugging along at the back, but it was stifling hot, at least I felt very hot, and I was wilting. Really not having fun anymore. It was too bad too, the roads were spectacular. Not Nebraska, "Odin's Revenge" type unusual, vacant territory, but Iowa style beauty that was right up there with anything else. I definitely was awed by the scenery. I felt I needed to say something to Ari about it. I rode up to Ari, (one of the rare times I felt strong enough to after the break), and told him he did a magnificent job and that the ride was doing really well. I thought. Ari was riding so strongly. He had his Salsa titanium single speed, and you'd never know he was on a single by the way he rode off with the geared folk. Really- this was all his ride anyway, he did all the legwork on it and sweated the details. Michael Lemburger rode with me for a stretch there. Thanks Sir! I wasn't able to keep up in the heat. A bit of shade and a B Road saw me bridge back up for a time. I took the fork in the road they didn't. Eventually I managed to drag my carcas into LaMotte. This was a planned rest stop. There was a city park with a shelter and a water source for us to utilize. By this time I was aware that a few people were worried about me and were kind of shepherding me along. You know who you are and I thank you for watching out for me. I got to some cool grass and laid down flat on my back. It felt great and all I wanted to do was go to sleep for a while, but I could not do that with the expectations of the group and the fact that this ride is named after me. I felt really low about all of it, really. It was kind of hard to deal with my fortune in life at that time, but it was what it was. I decided enough was enough. It was kind of ridiculous for me to be the anchor dragging back a group of stronger than me riders and making them take more time to do a route that was already going to be a late in the evening proposition to finish. I approached Ari and announced that I was bailing out. I had plenty of time to get myself back to Sabula and I roughly knew the way. I was all prepared to go it alone when several of the riders were trying to cheer me up and talk me into going at least to the next stop. The next stop.........which was the furthest point in the ride from the start. I was well aware of this, and also that the toughest hills of the ride were in this part of the route. To say I wasn't too stoked was an understatement, but I reluctantly agreed to their plans for me. The final miles with Mr. Paulsen. As we rolled, very slowly, out of town on a blacktop road, I was starting to really feel it already. Working hard and being so darn hot was really frustrating and was making me go slower. Suddenly, Chris Paulsen declared that he was bailing since he had a family obligation. The group was turning left. I asked quickly where he lived, and he said "near Bellevue". That was going in the right direction, as far as I was concerned at the moment. I then announced I was bailing as well, and I think only a few people caught on to that at the back of the group, but in a moment we couldn't see each other and the deed was done. Well, I was headed back to the car now, but the ride wasn't over just yet. We had a bit more "up" to go, then we had a sweet three mile downhill run into a few small rollers before we got to Bellevue. Chris was a great partner for me. He was hot and feeling like going slower as I was, and we chatted as we ran down the gravel to town. We talked about his racing days, folks he knew, and his and his wife's veterinary practice. Back in town, we stopped for some ice cold sodas and sat in some A/C for a bit, which did me worlds of good. Then we hit Highway 52 South of town till we got to a right hander and gravel roads again. Chris led the way to his home driveway and a long, snaking two track back to his awesome, rustic farmhouse. I asked about mileage, as I had no computer, and it looked like we had ridden about 75 miles for the day. Then he and his wife allowed me to have another soda and made me a sandwich before they carted me back to the start in a 4X4 Chevy. Chris had to go back and get his truck anyway, so it wasn't a big deal. I said my thanks and we traded goodbyes as they both left. Here I was- back at my truck....alone....and the air still stank like it did in the morning! I thought that was odd. Then I noticed that the ground was soft and sounded funny. It was the source of the smell. A billion dead Mayflies rotting in the sun. "Huh..... , I thought, as I grabbed a still cold New Belgium from my cooler and drained it, "Figures!" Well, an ignominious end to a ride I am associated with. I felt bad, but I knew I was doing the group a huge favor by cutting myself loose so they didn't have me to worry about. I got home by 5:00pm, and was in bed by 10:00pm, which gave me a good rest up before a busy day of work. Had I stuck it out, I doubt I would have made it to work Monday! And that was my story of the 2013 GTDRI. Gathering in the pre-dawn light. The alarm went off. It was a pleasant sound, and since I was half awake anyway due to some late night revelers nearby, I was up, feet swung out of bed, in a flash. We went about our morning business and were out of the door by about 4:40am on our way to the start area. When I pulled up to the Jackson County Welcome Center, there were a few cars there already, riders milling about, and I noted one of them was Steve Fuller. He had stayed all night there in his SUV. It was not a pleasant experience for him, as the River is lined with railway, and locomotives pass by all night long working hard to pull their loads. Also, the highway is quite busy as well, being the lifeline from one of the rare bridges across the Mississippi. As a bonus, the air smelled bad there. Like the cross between a wet dog's but mixed with rotting fish. Bleech! It was obvious that this was going to be the best attended GTDRI ride ever. The old record of twelve was smashed and people were still pulling in. Pumps were brandished and the hiss of the Presta valve could be heard off and on in the half-light of the early day. I conferred with Ari about how we should start, and right about 5am, I called the riders to line up in front of the old white school house on the grounds there. A look over my shoulder after the start. 23 people, including myself, were lined up ready to go on an adventure. There would eventually be 24 with my friend Jeremy, who was to catch us later in the morning. It was maybe a little past 5:00am, but we were off. A bit of a pavement climb and then we were on gravel. The group strung out almost immediately and some of the slower folks were off the back there and out of my sight. This was a big group with a diverse set of rider abilities. How would we keep it all together? I knew Ari was back there so I kept an eye out for the front runners and just settled into a groove. This was going to be a long, long day in the saddle, so no need to put in any leg-breaking efforts outta the gate. The weather was...well it was about as good as it gets in July. Probably in the 70's, not a cloud in the sky to start out with, and hardly any breeze. Oh....but I knew it was gonna get hot later! One of my favorite things about the ride right out of the gate and all the time I was with anyone was that there was chatter. Folks talking to other folks and enjoying each others company. So cool! This was no competitive deal, no one was showing their guns or trying to "put the hurt" on anyone. A ride on bicycles. In the country. This was awesome! Another really cool moment was when I was about mid-pack, cresting a hill. The next turn, a left hander, was coming up a quarter mile ahead of me. The field to my left was all rolling hills and a large herd of horses was pasturing in it. They were gathered at the corner as the lead riders approached. Then they turned and galloped along the fence line with the leaders. It was an awesome sight to see about 20-25 horses galloping along with the brightly colored jerseys of the riders. Well, those leaders, they were chatting up a storm and not looking to see how far ahead they were. I was not going to chase them down, but I took opportunities when they came up to work my way towards the front. One more downhill and a roller. Got to them! I cautioned them that we were getting really strung out and we needed to keep the "no drop" rule in effect. At the next turn we stopped then to gather up the stragglers. A hog barn in the morning light. Riding up with the leaders for a bit. Yeah, that was a spectacular view. I think we all were just soaking this one in and many were taking snap shots. It was really stunning, and it was super cool to see that many were really into the scenery and the ride. We passed through the village of Miles, then at Preston we gathered up the group again. Pushing off from there we were met with more hills and great scenery. Finally, after my tummy was saying I needed to eat, we arrived in Maquoketa, our first spot to refuel and resupply. I had been feeling pretty good up to this point and was excited to see even more stunning scenery. So, Just What Does "Self Supported" Mean? WW4M: Bike Bag Dude's "Chaff Bag"